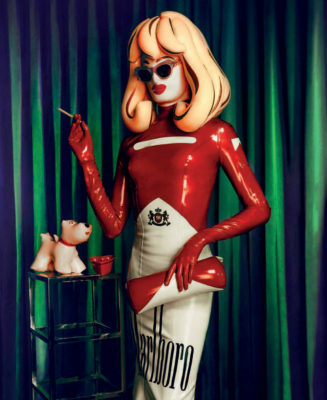 Fashion Week, at exclusive premières, events and exhibitions, often in the company of her inflatable white toy terrier Snowy, Pandemonia sees herself as a construction, made from idealised representations of the female form as well as a parody of the celebrity-driven fashion world. Here she intellectually discourses about the essence of her persona and how bubbly helps her to survive the rigours of self-invention. You were ‘born’ in 2007 and first grabbed media attention in 2009 during a Tracey Emin show at The White Cube Gallery in London. Where did the idea to become a Post-Pop Performance Artist come from? newspaper. I noticed the news was being pushed off the front page and replaced by celebrity. The link between commerce and celebrity was creating a strange new advertorial oligarchy. I decided to construct my own celebrity using the media’s own iconography as my building blocks. Has your evolution as an artist and rise to fame transpired organically? Do you design all of your own outfits and accessories? think this foundation is universally empowering. How long does it take you to get ready, from creating outfits to actually getting dressed? is, as Marcel Duchamp coined the term, “a readymade”. Creating the work is another matter. It takes about four weeks to make a head alone. It’s a complex process. Your art is considered cross-media, encompassing Sculpture, Digital Art, Photography and Performance. Are varsity and variety important to you? In many ways, Pandemonia is an allegory of human existence in the 21st Century; a modern-day ‘Rakes Progress’. Art needs to reflect the times we live in, and Pandemonia always gamely obliges. Just as advertising has becoming essentially omnipresent in this digital age, Pandemonia has naturally inhabited the same cross-media spaces. Pandemonia is meant to enter the world we live in today, a part of our collective mythology, come to life. You held your first art exhibition ‘The Marketability of Desire’ in 2015, featuring nine huge virtual sculptures framed by the stately grounds of London’s Hyde Park. What message do you want to convey through your work? In the digital age, the virtual is becoming part of reality. Just as the persona of Pandemonia springs from collective consciousness, her art exhibition comments on the world we’ve created. When I was creating the work I was conscious of the locations. Hyde Park and Kensington Gardens are in the centre of London’s most affluent district. One of the sculptures for instance sits on top of. How long did it take you to create these larger than life sculptures? These were created over the span of a year and a lot of legwork. You seem to bridge the worlds of art and fashion quite effortlessly. Where does Pandemonia feel most at home? What is your take on the fashion world? Do you find events such as London Fashion Week stimulating and inspiring? Fashion affects everyone. We all wear clothes; it defines who we are. Fashion Week is not just about fashion. It is a global media event. It is the perfect place to show my work. Fashion is inextricably linked to fantasy, a central theme for Pandemonia. Fashion’s invitation to express and reinvent ourselves is extremely powerful, especially in the event that it is misguided. Plus, Pandemonia loves a global media event! Who are your favourite fashion icons and why? Me and my puppy. They have so much to say. You have become quite an international personality and jetsetter. Do you still feel quintessentially British? Pandemonia is global and belongs to everybody. Name five of your ‘must have’ travel essentials. Everything I need to keep my head on. In the age of the selfie it seems as though everyone wants to be photographed with you. Why do you think the public loves you so much? I am a visual story. I give them something to document their lives with. plans or artistic projects for 2016? campaign for 2016. I have been shot by François Nars for his photo book, and have a cameo in a feature film to be released soon. Currently, I am designing some new work as well, that I am especially excited about. This entry was posted in Articles, Photo shoots and tagged ALBA MELENDO, ALUN DAVIES, inflatable art, Inflatable hair, JENNY BROUGH, latex, LIFE ON MARS, LOUBY McLOUGHLIN, ODDA, Pandemonia, Post Pop, SANDERSON.